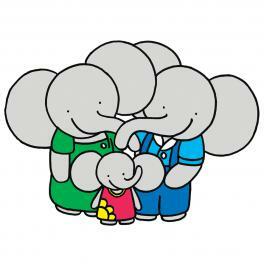 Sanga, the round-eared and friendly baby elephant, is Play and Learn with Miffy’s third character. Children love elephants because of the tail sweeping from side to side, the large and floppy ears, the big body that cannot be missed and the trunk that can be used to do so many things. Elephants are social creatures that remind us of the Ugandan culture of togetherness. They move in family tribes which makes the elephants just like a typical Ugandan family. Sanga loves to eat maize from father’s farm. Her ears are soft and wide and she has her mother’s sunny eyes - seeing bright things from every side. In the first book, we read about Sanga’s birth. She has a caring mother and a proud father. Her grandfather gave her the name Sanga. The book has been printed and we will distribute 1500 via our partner Mango Tree. Alongside the book we will distribute 7500 early child development posters focussing on malaria prevention. “Look, everybody in the Tembo family sleeps under a treated mosquito net. Even Sanga has a little net on her bed”.